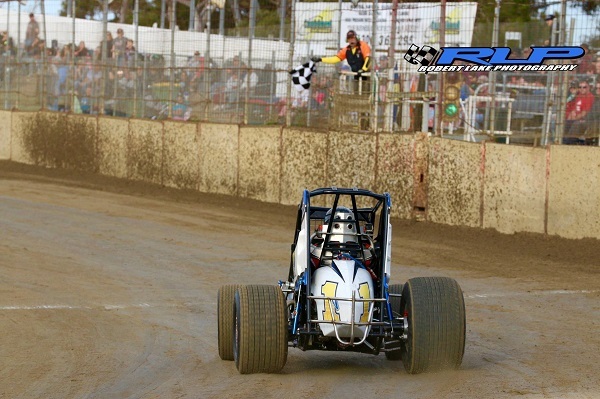 There will be no shortage of action during this Saturday night’s Victorian Wingless Sprint Title at Geelong’s Avalon Raceway, as a whopping 80-odd cars turn out to celebrate Australia Day in style. While over 70 Victorian drivers will be in attendance to ensure that the state title mantle doesn’t leave their home state, a small but determined contingent of seven interstate drivers from four different states and territories will be looking to upset their plans. Leading the charge for the Victorian natives will be defending champion Travis Millar, who has continued to build on his momentum since winning last season’s running of the event and has so far experienced a strong 2018-19 season campaign. Not only has Millar tasted feature-race victory already this season aboard the Vic # 1 Fitzpatrick Autosports car, he has done so at the Geelong venue, where he has significant experience that he will no doubt be putting into practice come Saturday night. Another driver who is no stranger to the 390-metre clay track is Dayn Bentvelzen, who has scored a handful of podium finishes so far this season, including a feature-race win. Along with Millar, the consistent Bentvelzen will be difficult to beat when he takes to the track, but a host of other drivers may be up to the challenge. Also racking up some minor podium finishes, most recently in the opening two rounds of the Summer Slam Series, along with qualifying pole for the third and final round which was declared early due to a crash, Luke Weel is a model of consistency who is more than familiar with what it takes to win feature races, as is veteran racer Peter Logue, whose wealth of experience will be invaluable. Fresh off the back of taking out the overall Summer Slam Series point standings, Luke Storer is enjoying a stellar season so far and he’ll be hoping to continue that form during the Victorian Title, while his older brother and outgoing Summer Slam Series Champion Daniel will be looking to repeat his victory at the track back in December. A lot can be said for experience, which veteran racer Tony Moule has in spades. Moule is a regular front-runner and will be expected to fare well, along with Geoff Cook, who has banked multiple minor podium finishes this season. Local Chris Halesworth is another driver who often performs well, along with Alex Ross, who will be driving for Michael Uebergang, and Carly Walsh, while 410 Sprintcar regulars Tim Van Ginneken and Sam Wren will certainly make things interesting when they take on the Wingless ranks. The always fast Hobson siblings, Todd and Ebony, will be amongst the nominations, as will the Mills brothers, Mathew and Jamie, who, despite their rookie status, have already achieved a 1-2 finish during their debut season at Rosedale Speedway and will be hoping to make a strong impression. A long list of other Victorian contenders will be aiming to put their best foot forward come Saturday night, particularly against the interstate invaders. South Australia will have strong representation in regular Victorian visitor and hard-charger Mitchell Broome, Brent Fox, who made a return to the sport midway through 2017 after almost 10 years on the sidelines, Kirby Hillyer and Normie Moore. New South Wales, Queensland and the Northern Territory will each have a single driver flying the flag, with Evan O’Bryan, Dan Moes and Tyson Newcombe respectively hoping to experience a strong showing. The Victorian Title format will see drivers contest two rounds of 10-lap heat races, a 15-lap B main and the 25-lap Victorian Title-deciding feature race.